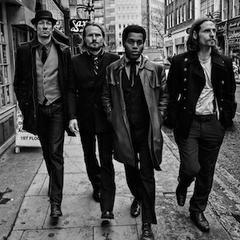 Vintage Trouble, based in Los Angeles, is the brainchild of Ty Taylor (vocal) and Nalle Colt (guitar). Combining their love for original soul and rhythm & blues, the two set up a basic home studio in Venice Beach and started crafting the beginnings of Vintage Trouble. Already a friend of both, Rick Barrio Dill (bass) came along and added his shared bass influences and energy into the newly formed project. To make the band complete, Richard Danielson (drums) was recruited not long after to add the authentic and edgy take that was needed on the drums. With these collective energies and inputs in place, a new kind of soul band had been born with unlimited creativity and force. This free EP features 4 tracks; the lead single off the debut album - "Blues Hand Me Down", a live track of their song "Love With Me", an acoustic version of their song "Nancy Lee", and a recording of their song "World's Gonna Have To Take A Turn Around" feat. the vocals of Trouble Makers (Vintage Trouble fans)"